Another pub having undergone a pretentious makeover. The upstairs - including the seats with the fine views over the River - are now part of an overpriced food-only "dining room". They were sitting empty when I was there while the remainder of the upstairs was filling up when people could have been watching the beautiful sunset with a pint - surely the main reason to visit this pub! This seems part of an irritating and mean-spirited trend to bilk punters out of as much money as possible instead of providing a comfortable and enjoyable atmosphere in which to enjoy a drink, company and maybe some food. 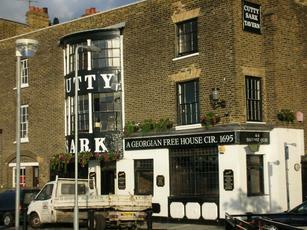 This pub was always on my drinking route in Greenwich. Not anymore. Great interiour, good food at 10.50 for burger / fish and chips.